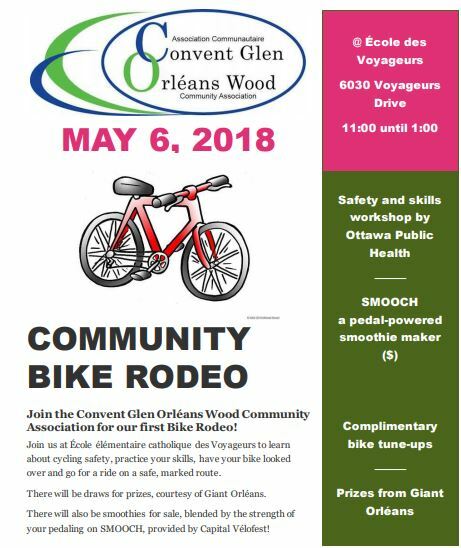 Dig out your bicycles and join the CGOWCA for some bike safety tips, equipment checks and a lovely ride along the Ottawa River Pathway. This FREE event is open to residents of all ages. Join us next Sunday at 11 a.m. at École des voyageurs – 6030 Voyageur Drive. 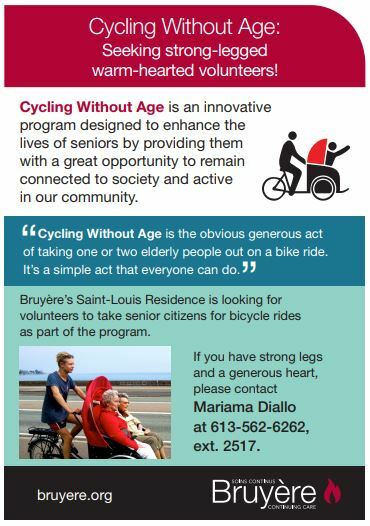 The city’s Cycling Education Team will provide safety tips and skills training. A community member will help you tune up your bike. We’ll draw prizes courtesy of Giant Orléans. Did you know? May is Bike to Work Month! Visit https://biketoworkottawa.ca/ for more details and to sign up. Ottawa is at a watershed moment for progress on walking, cycling and transit. The City of Ottawa’s new policy on “complete streets” for all users, the advent of a transformative Light Rail Transit project, and substantial infrastructure investments from the provincial and federal governments make this a key moment to assess an outlines for implementing a safe, healthy and environmentally responsible streetscape at scale. We would be honoured if you could join us at the Active Transportation Summit on Wednesday May 16, 2018 from 5pm-8pm at Christ Church Cathedral. 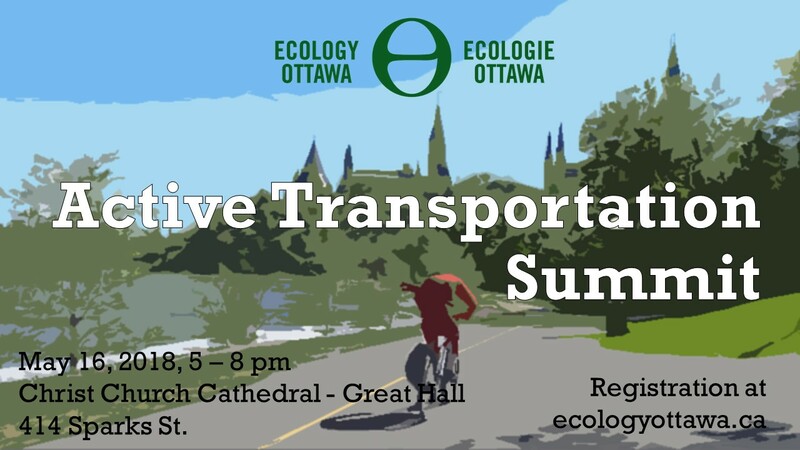 Registration is now open, and you can register at https://www.eventbrite.ca/e/active-transportation-summit-ti…. Have you and your furry friend and/or child been looking to go for a walk around the neighbourhood? If so, we’ve got the perfect idea for you! The CGOWCA is organizing a 3km walkathon to help raise funds and awareness for the Canadian Cancer Society! Come enjoy a nice walk down by the Ottawa River all the while meeting new people and raising awareness for a great cause! We promise it’ll be the best walk you’ve ever had! When: Saturday, April 28th at 10am. Raindate: Sunday, April 29th at 10am. Why: To raise funds and awareness for the Canadian Cancer Society. What: 3km walkathon, everyone is welcome. Meet us at École des Voyageurs, learn about good helmet fit, try out a small “obstacle course”, then follow a marked route – at your own pace! – to explore the pathways in our neighbourhood. The event runs from 11 until 1; there is no firm start time for the ride portion, participants can come and go on their own schedule. More details to come on our Facebook page! If you want to donate items: We accept donations at 622 Valin Street every Monday evening from 6-7pm sharp. We accept all small appliances that work, all kid items (including clothes), glassware, lamps, seasonal items, small tables, bookshelves, artwork, mirrors, gently used adult clothing, toys, novels, tools, crafting items. If you have old plant pots, please donate them as we will have a plant sale again this year. If you have house plants you want to multiply for the sale that would be great too! The Orléans Community Garden supports the Ottawa Mission Rooftop Garden along with the Ottawa Little Theatre Garden which donates it’s produce to the Ottawa Mission. We also donate excess food to the Ottawa Mission on a weekly basis which adds up to between 2,000 – 4,000 lbs depending on the weather. We also provide FREE educational field trips to schools in the area. Many have taken advantage of these field trips already and the feedback is great. Tell the city about your favourite pothole! It’s pothole season in Ottawa! Did you know: You can report a number of concerns online (potholes included) with the city of Ottawa’s online reporting tool. Topics include Animals and Pets; Complaints and Compliments; Garbage and Recycling; Health and Safety; Noise; Parking; Parks and Trees; Property Damage or Maintenance; and Road Maintenance. Go to www.ottawa.ca and click on Report or Request. This tool is also accessible from your mobile device. You can report a pothole using a specific address or intersection, and you have the option of adding a photo. You can also report a pothole directly through this link: https://so311.serviceottawa.ca/selfserve/?reqId=2000164&lang=en&form=Road_Maint_Surface.Pothole. Do you ever wonder what this City will be when 2- 3 million people call Ottawa home? Can you imagine how everyone will get around, where they will live or work and how climate and new technologies may change the way we do things? In December 2016 City Council directed that a planning study be undertaken that will begin to look at what the answers to these questions might be and how to position the City so that it can prosper from what we know will happen in the future but also create a city that is adaptable and responsive to changes that are less certain or even unknown. The CGOWCA is working on finalizing two community events in April. Mark your calendars! Family fun for cyclists at the Bike Rodeo at École élémentaire catholique des Voyageurs on April 21st (tentative). Dog walk-a-thon fundraiser (bring your furry friend) on April 28th! Looking for something to do on Family Day? Come to the CGOWCA Winter Carnival! The Carnival will run from 10am to 2pm on Monday February 19th on and around the St Moritz rink, behind Convent Glen Catholic School. We will have different games and activities that are fun for kids and adults. Bring your skates if you would like to enjoy the rink. There will be free maple snow taffy (while quantities last) and refreshments. RSVP on the event on the Facebook group (https://www.facebook.com/events/1414806265296985/) and bring your neighbours! Have you heard about OHIP+? As of January 1, 2018, all babies, children and youth age 24 years and under who have OHIP coverage are automatically covered by OHIP+: Children and Youth Pharmacare. OHIP+ covers more than 4400 prescription items! Synapcity, an organization that connects people across diverse communities to share perspectives and create positive change, will be holding their Civics Talk in Orléans on February 22nd and March 1st at Shenkman Arts Centre. Find out more or register by visiting http://synapcity.ca/workshop/orleans/. The outdoor rink is in great shape, and is being well-used by kids and adults of all ages in this wonderful winter weather! Put garbage in the garbage can. When the ice needs shoveling, and someone starts, do not keep skating – put sticks and pucks aside, and help out. Please control behaviour and language – this is a public rink. After shoveling, please return shovels to the exterior of the shed. Please do not leave anything on the ice which could endanger the volunteers who are clearing the ice – pop cans or bottles, hockey sticks, pucks, etc. can be a danger to those working on behalf of the participants, using the snow blower. Lastly, the lights go out at 11 pm, and we are trying to water every night, weather permitting. If you are one of the last groups on the ice, please scrape the ice and remove any snow. This will improve the quality of the ice for the next day. Also, the nets should be taken off the ice surface. I am enjoying my first year as the rink operator, and with the cooperation of all participants, hope to be able to continue in the role for a few more years – volunteers always welcome! The Ski Heritage East Trail is a go! With funding of $15k from the City, community support through our GoFundMe page and a generous contribution from the CGOWCA, we have been able to begin grooming. Negotiations are underway to bring a major private sector sponsor on board soon. We will also have an on-line raffle, with cross country skis donated by Giant Orléans, as well as other goodies from local merchants, as the prizes. The Trail, which runs from Green’s Creek in the west to Trim Road in the east, was groomed last Thursday and is scheduled for more grooming this week. Despite the recent frigid temperatures, local residents have been flocking to the Trail on skis, snowshoes and fatbikes, as well as the usual hardy contingent of dog walkers. Please join us at the Official Launch of the Trail on Wednesday, January 17th at 1 pm. We will be joined at Cairine Wilson HS by Mayor Jim Watson, Bob Monette, the Ski Heritage East Team and others associated with the Trail. Watch our Facebook page for updates, as well as for trail conditions. Please send us your photos from the Trail so we may post them to our page. Come one, come all to the Convent Glen Orleans Woods Community Association’s Winter Carnival! The Carnival will be taking place on Family day (Monday, February 19) between 10am and 2pm behind Convent Glen Catholic School. There will be games and activities that will be fun for the whole family! There will be events both on and off the ice so make sure to bring your skates (if you’d like to enjoy the rink). As well, we will be offering free maple snow taffy (while quantities last), hot chocolate and coffee. This is a great opportunity to get out, have some fun, and meet some members from your community and community association.